“The Church in Egypt has been strengthened by the murder of our brothers in Libya.” Such was the reaction by Coptic Catholic Bishop Youssef Aboul-Kheir of Sohag to the beheading of 21 Orthodox Coptic men in Libya by ISIS. The guest workers in Libya “suffered a holy death with prayers on their lips. They went to their deaths just like the early Christians,” the bishop told international Catholic charity Aid to the Church in Need, adding that their deaths angered Egyptian Christians and Muslims alike, and reporting that President Abdel Fattah el-Sisi visited the family homes of the victims. As fate would have it, ISIS released gruesome video of the executions on the very day, Feb. 15, 2015, that Egypt’s Catholic Coptic Church celebrated the consecration of the first ever church in Sinai, Our Lady of Peace, in the community of Sharm El-Sheikh. The name had been chosen by Susanne Mubarak, widow of the ousted Egyptian President Hosni Mubarak. Mrs. Mubarak, who was educated by Catholic nuns, ensured that construction of the church could proceed after years of delay and opposition by local political leadership. 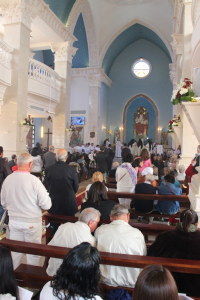 “This is a great day of joy for Catholics in Egypt,” the local ordinary, Coptic Catholic Bishop Makarios Tewfik of Ismailia, said at the consecration ceremony. “We have a number of places of worship in Sinai”—a famous tourist destination where hundreds of hotels line the coast known for its spectacular coral reef—“but these are chapels or even just rooms in normal houses. The church of Our Lady of Peace is the first proper church building that was built for the sole purpose of worshiping God,” he said. Father Bolos Garas, the local pastor will celebrate three services in the church every Sunday. “I am a Coptic Catholic priest. However, there are very few Coptic Catholics here, just a handful of families. Most of our faithful are tourists or foreign workers. For this reason I not only celebrate Sunday Mass according to my Church’s rites, but also according to the Roman rites, in both Italian and English,” he said. The English-language service will primarily cater to Filipinos, guest workers in the local hotel industry, while a sizeable community of Italian retirees who spend winters in Sharm El-Sheikh will hear Mass in their own language. Patriarch Ibrahim I Sidrak, head of the 200,000-member strong Egyptian Coptic Catholic church, presided over the consecration ceremony. Meanwhile the brutal killing of the 21 men hangs like a cloud over Egypt’s Christian community, which already faces home grown Islamic extremism “I am afraid of the Salafists in the country,” said Bishop Aboul-Kheir, who added that “they speak with forked tongues. The Muslim Brotherhood is opposed to society anyway. So there exists an internal danger in Egypt itself.” Egypt’s Christian leaders are concerned that extremists may be voted into power during upcoming parliamentary elections. The construction of Our Lady of Peace was made possible by financial support from Aid to the Church in Need.